What if your home was burglarized? . . . . You’d probably suffer a loss. What if your home was burglarized by someone who was working closely together with someone inside your household in a position of trust? . . . . You’d probably suffer a loss that was much greater. What if the person of trust in the household expected and planned to help the burglar get away with everything (and they along with the burglar) by leaving “receipt” lying in the moonlight in place of the items absconded with that purported to be evidence that you had been “paid” for the items that would no longer be in your possession when, in fact, you would never receive any money for them of any kind?
. . . . . You’d probably think that was adding insult to injury and be very much annoyed. What if your home hadn’t yet been burglarized but you knew that the above scheme was about to unfold and furthermore you knew that the plan when they looted your home was to direct their attention on quickly seizing as many valuable items as they could, starting with the most valuable first. What if you knew they intended, so that their acts would be as irreversible as possible and would leave as little trace as possible, to melt into bullion the gold watch inherited from your grandfather and to break up the heirloom jewel necklace that came down through your grandmother, recutting its renowned and remarkably large one-of-a-kind stones into smaller unrecognizable fragments?
. . . . . You might feel an extraordinary sense of urgency about the need to make sure that none of this actually happened. This then, by analogy, is roughly where we stand with respect to the libraries of New York City which are about to be sold off in a shrinkage of the system intended to create real estate deals to benefit real estate developers. Insiders within the library systems of New York have been studying the real estate assets they hold on behalf of the public and they are planning to hand them off to developers in deals that haven’t been adequately described or consented to by the public even though it is the public to which these often one-of-a-kind assets truly belong. 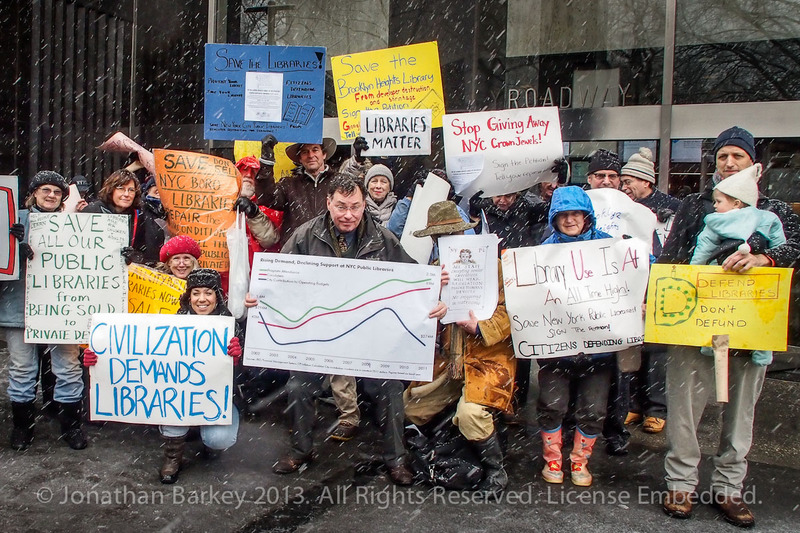 That’s why Citizens Defending Libraries, in which I am participating, gave testimony and held a rally a week ago Friday about budget issues related to New York City's libraries at the March 8, 2013 hearings on: New York City Council Fiscal Year 2014 Preliminary Budget, Mayor’s FY ‘13 Preliminary Management Report and Agency Oversight. (See the picture above.) Citizens Defending Libraries was joined in giving testimony by representatives from the Committee to Save The New York Public Libraries. A report on all the testimony is available from Citizens Defending Libraries here: Testimony By Citizens Defending Libraries At March 8, 2013 City Council Committee Hearing On Library Budget Issues. The prototype deal representing this sort of metaphorical burglary was the sudden 2008 closing of midtown Manhattan’s Donnell Library, for decades one of the city’s main central libraries across from the Museum of Modern Art. “One of the most heavily used branches,” (according to the New York Times) it was closed suddenly and without warning in the spring of that year for sale and shrinkage and its collections were disbursed. The sale came not long after the library had undergone a series of significant and expensive renovations which we may consider, were, in the end, publicly paid for. The initial announcement of the sale, which largely escaped public notice, was in early November of 2007. 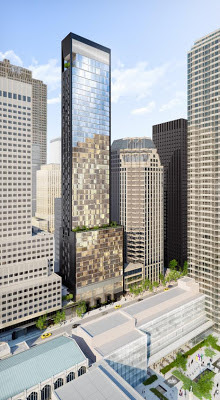 50-story Baccarat Hotel and luxury residence tower from the Daily News. Click to enlarge (if you dare). Was this creation of a huge, vastly larger building with such significantly shrunk library intended to benefit the library system and the public? That hardly seems a supportable proposition. • When the Donnell sale was first and suddenly announced the information was given out that it would be replaced by a much smaller building than has actually turned out to be the case. It was announced that the building that would replace the library would be am eleven-story hotel, not a 50-story building. 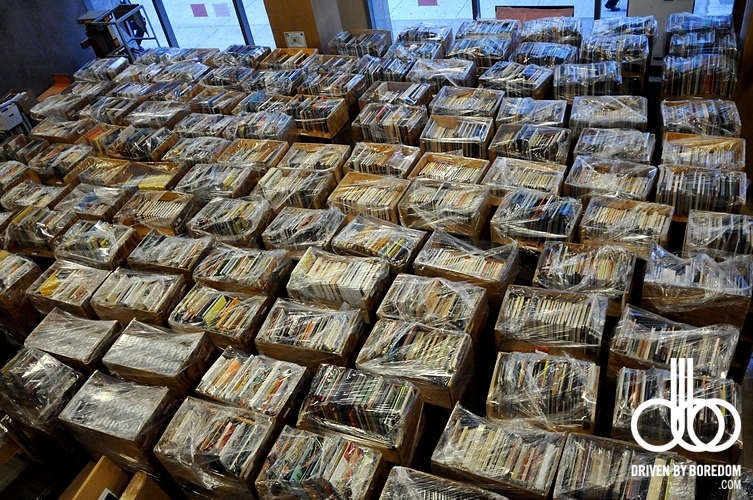 • When the Donnell sale was announced the public was told that the library would close in a year, in the fall of 2008, but instead they closed it suddenly almost six months sooner. • The public was told that the new library to replace the Donnell would be “completed in no more than three-and-one-half years” which means it should have opened in the fall of 2011. Now more than a year after that projected date the replacement library is still not expected to arrive on the scene until at least 2014. • The real estate deal and closing of the library was being rushed. Consequently, the real estate transaction for which the library was closed was not adequately locked up with signatures, documented and assured, and it did not consummate. Taking such risks may have potentially benefitted those involved in putting together the real estate transaction. Taking those risks did not benefit the public. • When Donnell was closed the public (and Manhattan’s Community Board 5) was promised a temporary library in the same vicinity. That promise was also not fulfilled. 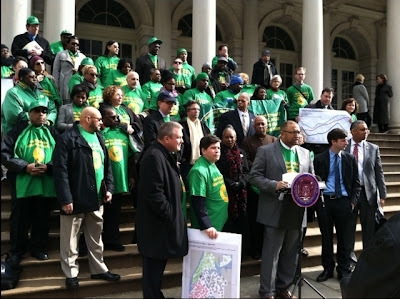 • Despite all the city funding going into Donnell and to the New York Public Library, library officials chose to sell off Donnell without informing public officials, including the City Council, about it and without input from the public or librarian professionals. • When Donnell was closed the public was told that Donnell was in serious need of repairs even though it had just been renovated. It should be a warning (see Citizens Defending Libraries testimony) that among the repairs presenting insurmountable problems was an “outdated air-conditioning” system. It now seems guaranteed that when library officials want to sell libraries for real estate deals they will reflexively cite air conditioning as a problem and conjure up amazing estimates of the costs that would be involved in dealing with the problem, thereby justifying demolition of public assets. This past Tuesday I testified before the budget committee of Manhattan’s Community Board 5. The annual cycle of reviewing and advocating for adequate city funding of the libraries is upon us again so this issue was before them. I told them that what had not been stopped with respect to the Donnell debacle within the Community Board 5 boundary lines was now being continued with a similar shrinkages of other main libraries with the Central Library Plan, and once again it was being done in obeisance to real estate industry priorities. 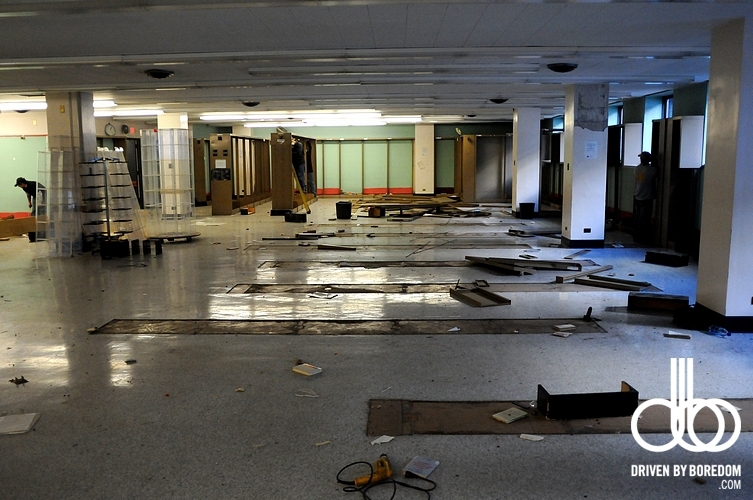 (The Central Library Plan involves the shrinkage and consolidating sell-offs of the Mid-Manhattan Library, the Science Library (SIBL) and the Tilden Astor 42nd Street Central Reference Library with a ripping out of the research stacks at the Central Reference Library, effectively decommissioning it as the research library it was meant to be and has functioned as since 1910. I also pointed out how the Donnell prototype was being exported with similar deals now being proposed in my own home borough of Brooklyn. My message was that because the line had not held at Donnell, because there had been no successful insistence on redress and rectification of the plundering, that now all libraries in the city were in jeopardy. And I told them that if we can’t hold the line at libraries, we won’t be able to hold the line at anything in this city. At this point I should probably deal with the metaphor of the home burglar and the insider trusted within the householder expecting that they can somehow get away with their theft by leaving a “receipt” that says the burglarized homeowner is being paid for the stolen items. What the public is being told as these properties belonging to the public are plundered is that they can expect to be “paid” for whatever is sold, that somehow money will go into the library system as a result. In fact, because money is fungible (so that the money does not go to the libraries), the situation is quite the reverse: Whatever money might somehow with a theatrical flourish be earmarked as theoretically going to libraries as a result of any of these transactions, the city, under Bloomberg, is pursuing a plan of cutting library funding to the bone, engaging in an absolute starvation of the system. And because Bloomberg’s incentive is to underfund the libraries, to “demolish" them "by neglect” with the goal of pushing through these fire sales benefitting buddies in the real estate industry, the pursuit of these pending sales is actually bringing library funding to an unprecedented all-time low. Chart from Center For An Urban For Future report showing sharp decline in funding against escalating use. That bump in blue funding line is the third term elections. 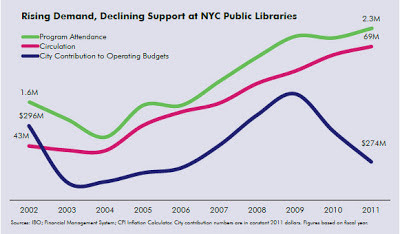 The steep decline is implementation of the plan to sell libraries. That libraries are underfunded is without doubt: “More people visited public libraries in New York than every major sports team and every major cultural institution combined.” . .
. . .. . . Libraries are the little guys. They are a pittance that should be easy to include in the city budget, especially given that the money goes far since libraries are so well used. So I made the point to the Community Board 5 board members at the Tuesday committee meeting that not only is the Donnell Library real estate deal being exported outside the boundaries of their community district, this has also resulted in an underfunding of the library system being exported to every borough of the city. I called upon them to rectify the Donnell situation and also to examine and stop the Central Library Plan that, although it is impossible to know exactly how much it will cost (and figures and designs keep changing), will be very expensive in a foolhardy way. The reason that plan calls for money to be used so stupidly, rather than in the much better ways in which it could be used, is that it concentrates on generating the still under wraps real estate deals the public presently has very little consciousness of. Eric Stern, the head of the Community Board 5 Committee, told those of us who were there to testify against the planned real estate sell-offs that he and others on the board were in favor of the Central Library Plan and had previously committed to it because they had listened to a presentation of it by the New York Public Library President Anthony Marx and they believed him. I told them that they had ample reason to reconsider any commitments to the plan given that the numbers, not yet defined, keep changing and, that as Veronika Conant from the Committee To Save The New York Public Library was about to testify, her committee has promulgated a valuable new truth document (press release here) providing ample reason not to believe what was in President Marx's presentation. President George W. Bush may have had a problem conceptualizing what exact rules are supposed to apply about allowing the same people to fool you twice: I would expect a lot more from Community Board 5. Has Community Board 5 really taken all those bullet-pointed lessons from Donnell appearing above and applied them to the Central Library Plan? Have they considered how tall a building will be put up when Mid-Manhattan is sold? What about SIBL? What exactly is the public being told at this point and what should the public be told? Are there new behemoths the size of the Chrysler Buildings in the making- The bulk but not the beauty- looking like the hotel going up where the Donnell stood? In one respect the week-ago-Friday City Council budget hearings before the Committee chaired by City Councilman Jimmy Van Bramer provided an interesting additional connection between the libraries of Manhattan and the sales in Brooklyn that are being modeled after the Donnell sale. In Brooklyn one of the two first deals the Brooklyn Public Library is trying to push out the door is a sale of a central library at 280 Cdman Plaza on the border of Brooklyn Heights and Downtown Brooklyn. As President Marx answered questions it could be observed that he was constantly being fed information by Chief Operating Officer David G. Offensend. Mr.Offensend, who hails originally from the world of investment banking, is also a “past president of the Brooklyn Heights Association.” More recently, he was just a Brooklyn Heights Association board member. He isn’t any longer, but the possibility that people in the neighborhood like Mr. Offensend might still have influence with members of the Brooklyn Heights Association board is a matter of serious alert particularly in that the BHA is showing a perplexing lack of concern about the attack and elimination of the neighborhood’s library and seems also to care very little about how this attack is part of a system-wide plundering of library resources. More on this in a moment. Without organizations such as the BHA rising to join ranks with others facing similar jeopardy throughout the city we can expect that the city’s real estate industry will get its way in decimating the system. Many conversations returned to the figure of David Offensend, co-founder of Evercore Partners, a private equity firm with a market capitalization of a billion dollars. Offensend joined the library in 2004, in part because the trustees felt that the institution’s money was not being handled with due care; he now serves as chief operating officer. According to staffers, Offensend has been instrumental in the shift toward a “business and metrics” sort of thinking. 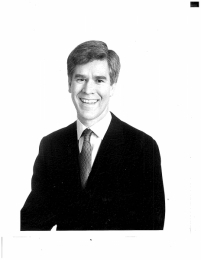 He told the Princeton alumni website in 2009, “If an organization is receptive, the application of business world experiences can have a huge positive impact.” But what kind of business and what kind of metrics? It was under Offensend that Booz Allen was brought in; it was under Offensend, and in the wake of the Schwarzman gift [$100 million in March 2008, a date that coincides with the Donnell sale], that the ambitious plan to fundamentally reconfigure the library took shape. Offensend described the plan to me this way: “We did not think that putting the central library in [the main building] was an investment per se in the branch libraries versus the research libraries. It was rather one plus one will equal significantly more than two.” We can see here the familiar arithmetic of corporate downsizing. Mr. Offensend started with the NYPL in 2004 so he was working for the library when the Donnell sell-off plan was fabricated. More than anything, this rhetoric reveals the fundamentally anti-democratic worldview that has taken hold at the library. It is of a piece with what the new Masters of the Universe have accomplished in the public schools, where hedge funders have provided the lion’s share of the backing for privatization, and in the so-called reforms to our financial system, where technocrats meet behind closed doors to decide what will be best for the rest of us. Oligarchs acting in the people’s name (with the people’s money) is not democratic; selling off New York’s cultural patrimony to out-of-town heiresses, closing down treasured divisions and branches, pushing out expert staff, and shipping books to a warehouse in the suburbs, all without consulting the public, is not democratic. If the reconstruction goes through, scholarly research will be more, not less, concentrated in the handful of inordinately wealthy and exclusive colleges and universities. The renovation is elitism garbed in populist rhetoric, ultimately condescending to the very people the library’s board thinks they’re serving. . . .
New York Times architectural critic Michael Kimmelman has made the same observation and in Noticing New York, building on Kimmelman’s observation, I pointed out the bigger picture truth: The effect of these cutbacks and shrinkages of service is going to fall very heavily on those of lower income and the less advantaged in our society. 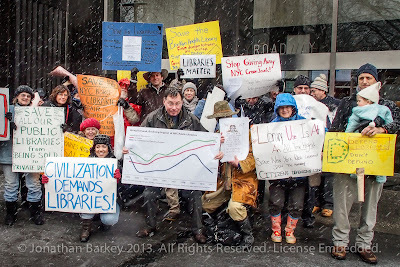 See: Saturday, February 9, 2013, Libraries That Are Now Supposedly “Dilapidated” Were Just Renovated: And Are Developers’ Real Estate Deals More Important Than Bryant Park? Every year for more than two decades I have gone on the Brooklyn Height House Tour, the annual mainstay fund raiser for the Brooklyn Heights Association, where the showcase houses of the wealthy and well-off in Brooklyn Heights are put on display. What I have noticed, true to this day, is that those homes, with a lot of space to fill and a lot of money to fill up that space up with are, more often than not, full of books everywhere, lots of shelves, sometimes stacked, almost always by the bedside and in the master bedrooms. The owners of one house recently showcased ripped out a floor to devote space to a beautiful multi-level personal library with balconies ringing the upper level. It’s not that these home don’t also have computers. They do. And CDs and internet access. They have everything. What this means is that the underfunding and shrinkage of libraries isn’t only failing to address what David Giles calls the “digital divide” in his Center For An Urban Future report, Branches of Opportunity, that growing separation of opportunity between those who have computers and access to the internet. We are opening up a brand new chasm, those with access to books and those without. By comparison, the BHA is asking for far less with respect to the Brooklyn Heights library than Community Board 5 was asking for when it was opposing the Donnell Library closing in its community. Community Board 5 didn’t get what it asked for and it has since lapsed in addressing the issue but the BHA isn’t putting up a fight at all. It may consequently expect to achieve even less than Manhattan's Community Board 5 achieved. One could have supposed that Anthony Marx as president of the NYPL might not have needed to have been fed so many basic figures by his chief operating officer, David Offensend given, that Marx is, most assuredly, a very handsomely paid individual. Exactly what he is paid does not seem to have been made a matter of public record yet, but a 2006 New York Times article commented on how Mr. Marx's predecessor in office, Paul LeClerc, was paid $800,000 (plus an unneeded $136,110 as a housing allowance) according to the most recent NYPL tax return filed that year, which the article noted was a jump of more than $221,000 from the year prior. 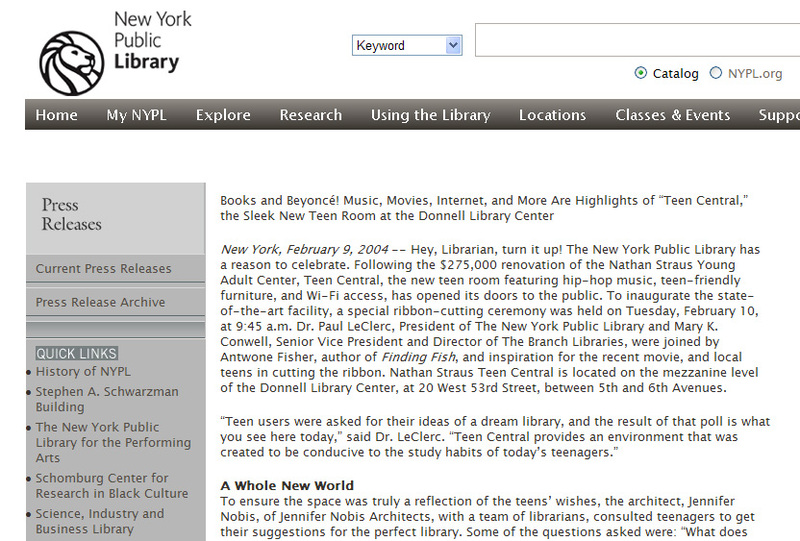 See: November 19, 2006, New York Library Officials’ Pay? Shhh, by Serge F. Kovaleski. • Nor for computers or access to the internet.
. . . bringing together all of the publicly available data on the library’s budget shows that much of the increase in baseline costs has gone to pay the salaries and benefits of staff members whom the library, in the data it provides to the ARL, has not reported as part of its traditional staff. In 2010, these staff members received $28 million a year in salaries and benefits; the research library’s more traditional staff received only $26 million. What exactly do these people do? They’re not senior management, and they’re not fundraisers. I asked the PR department repeatedly for more information and never received a definitive answer. Some of these staff members work for the digital department; others could be traditional catalogers who, since the research cataloging department was recently merged with the circulating cataloging department, may perhaps not be reported to the ARL. Many of the former staff members with whom I spoke suggested that a notable portion of these funds may be going to the library’s internal strategy department. A single department couldn’t account for such a large increase, but when asked about the current budget for the strategy department a library spokesperson could not provide a figure. Considering the amount of money going to these and other staff members, this is a subject more journalists may want to investigate. The heads of the Brooklyn Public Library and the Queens Library are not quite so well paid although many an average citizen would be jealous of their salaries. 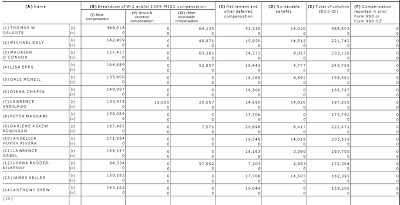 Linda E. Johnson of the BPL gets an all-in compensation figure of $333,109 according to the most recent tax filing by the BPL (see below). 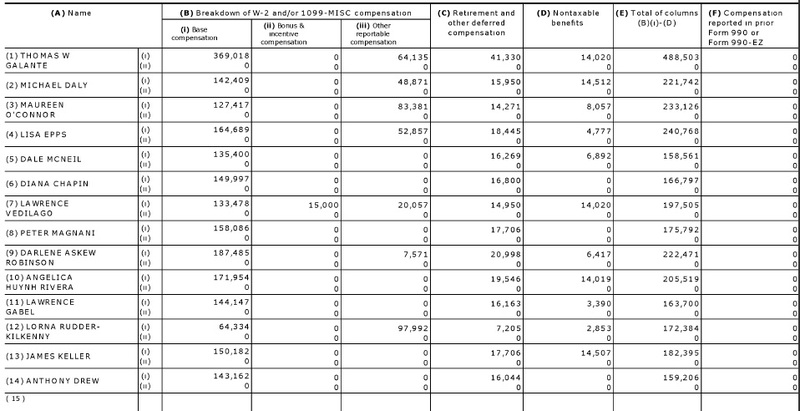 Thomas W. Galante of the Queens systems gets an all-in compensation figure of $488,503 according to the most recent tax filing by the Queens system (see next chart extracted below). Meanwhile, librarians themselves are fighting lay-offs, shorter hours and cuts to the system. 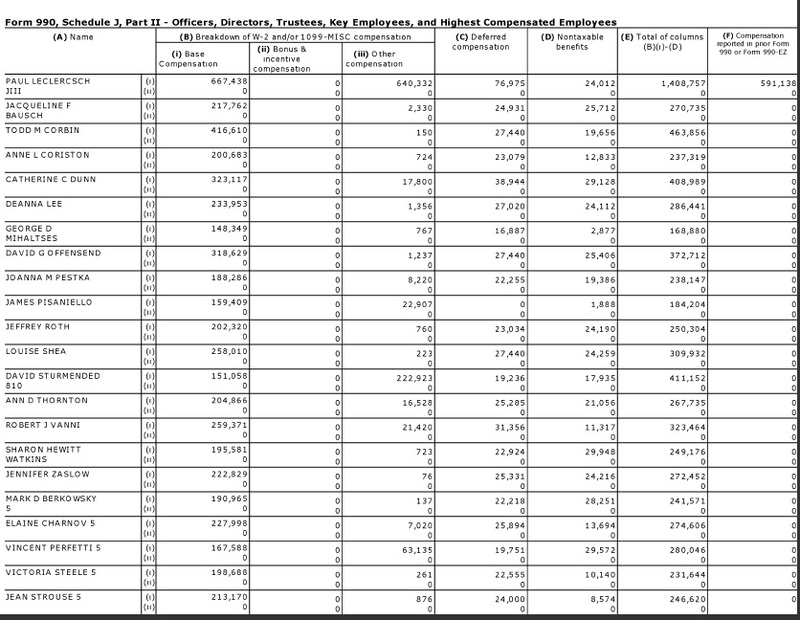 What are these salaries about? 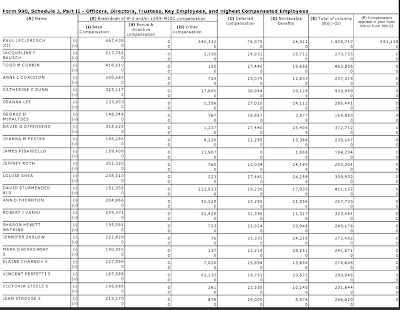 High salaries for senior administrators and people in the NYPL “strategy department”? What about the relatively higher and skyrocketing of salaries in Manhattan vs. Brooklyn and Queens? Isn’t it all about real estate? Aren’t these the salaries of people who play high-stakes real estate shell games and engage in the high-stakes finances and behind-the-scenes arrangements, partnerships and syndications that power it? People who are more in the class of Stephen Allen Schwarzman, the head of chairman and CEO of the Blackstone Group? Mr. Schwarzman's Blackstone is a huge private investment, real estate and mergers and acquisition and hedge fund investment firm with interests, among other things, in hotels (a very early focus of its investments in real estate). Mr. Schwarzman is the trustee on the board of the NYPL who is understood to be driving the NYPL Central Library consolidation, shrinkage and sell-off plan the hardest. He is also the trustee whose name has now been placed on the Central Reference Library where these highly-paid administrators are now proposing to demolish the research stacks in preparation for this system shrinkage. His name was placed upon the building as a result of his $100 million “gift” to the library in March 2008, contemporaneous with the announcement of the closing and sell-off of Donnell to create a hotel and the inauguration of the Central Library Plan that he champions. With the demolition of Donnell, so went the teen center and everything that had been put into it. Funding for the renovation was said to have been made possible, in part, with funds from the Estate of Charlotte H. Porter, and while that gift is thereby lost it was what was supposed to have been a gift to the public, so the public lost something and whatever other funds paid for the renovation whether they came from the city (as is often the case) or not, this was public property and therefore a waste for the public. There was another recent renovation of the Donnell that was similarly jettisoned to history's dust heap. There was a relatively new auditorium and media center. My understanding is that they were the product of a renovation completed in 2000-2001. I was told, but I don't have verification, that the cost involved over a million and a half dollars provided by the city. Whatever the case I am sure that the cost of the renovation was significant and in the end the loss of these things is a loss to the public. Donnell auditorium being used for Jane Jacobs event in 2007, just before its announced destruction. Less than ten years after its expensive renovation? You can also see pictures of the destroyed Donnell as it was being gutted in a series of images from Driven By Boredom at The Donnell Library Center: A Eulogy In Pictures, December 11th 2008, (and here) three of which are below. Again, the cavalier sacrifice of these new and recently publicly paid for renovations to the deities of real estate help accentuate our recognition of how senselessly galling these losses are, but it is important to remember that, in the end, it isn't just the recent renovation work that is being scrapped: It is also most importantly the irreplaceable underlying assets. For those who remember it, the Donnell was made of the same Indiana limestone as Rockefeller Center, two blocks away, and shared in some of its stately graciousness. The discussion that evening addressed many of the uneasy ills confronting the city in terms of overdevelopement, the carelessness thereof, and the increasing disparities between conspicuous wealth lack of wealth. One of the lines in the midst of the evening was Clyde Haberman's comment that Mayor Michael Bloomberg never met a developer he didn't like. The concluding lines of the Times article actually came out of an exchange that concerned the privatization we are seeing as ever more ubiquitous “business improvement districts” (BIDs) are taking over and assuming what used to be government functions. Nevertheless they have application to what is happening with the sell-off of libraries and the shrinkage and underfunding of the system that accompanies such a sacking of the public’s assets. There is something profoundly wrong when government cannot deliver basic services . . . So does it help that they say that when we sell off our irreplaceable libraries those theoretically trusted insiders on the inside who are assisting will be leaving a receipt, as if we have been adequately compensated for the loss?